Capricorn September 2015 Horoscope foretells that job and professional decisions will take priority over domestic and love relationships. Legal issues will be resolved in your favor this month. Thanks to the Mercury retrograde in September 2015, you have to design your life to suit your aptitude and there is no need to rely on the help of others. You can be friendly with others and seek their support where required, but this is not compulsory. People of the Capricorn zodiac sign will see remarkable growth in your career and you have the support of family and superiors. The path to success will be easy both in your job or business, foretells the horoscope 2015. The September 2015 Capricorn monthly astrology predictions forecast that you will be worried about your financial prospects this month. You will earn enough money to cover all your expenses. Your savings will help you in times of difficulty and your apprehensions about your current monetary situation are unwarranted. Balancing career needs and family requirements will be difficult in September 2015. 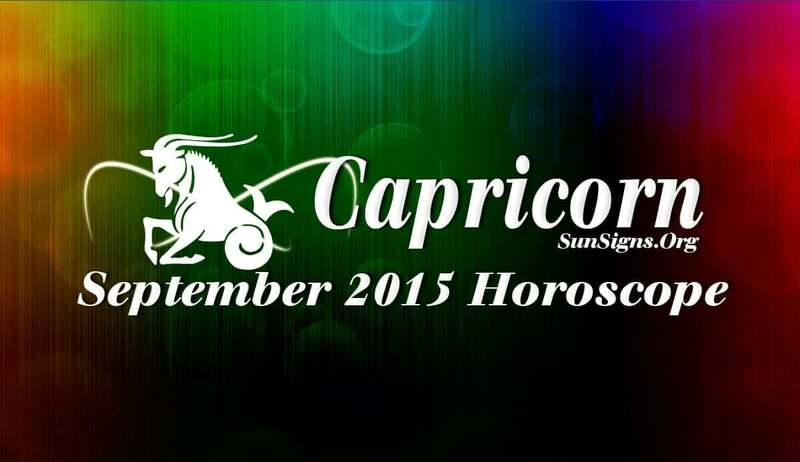 And this will be a source of friction when it comes to relationships for the Capricorn. But in the end situation will become delightful and harmony will prevail. Misunderstandings can be eliminated by proper communication with family members. Singles dating online can think of having a good attractive video dating profile. Pregnancy is best avoided this month. A pleasure trip with family will enhance your health in September 2015. Spiritual meditation will improve your emotional well-being which will bring more confidence and optimism in life. Do not let anxiety and stress lead to a panic attack.